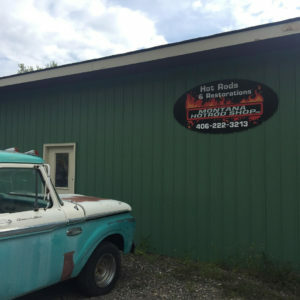 In Nebraska, rural districts have been undertaking a wholesale needs assessment of local Career Technical Education (CTE) program offerings under the state’s reVISION initiative. Under reVISION, school and district leaders examine regional labor market data and hear from local employers to determine whether or not the programs available to students are those that are most in-demand. If programs are out of sync with workforce needs, or deemed to be low-quality, local leaders will phase those programs out and transition resources and staff to higher-need program areas. This includes retraining teachers to teach classes in subject areas with the highest need, such as agriculture, health care and precision manufacturing. Nebraska is just one of many states working to strengthen the CTE teacher pipeline in rural areas by recruiting qualified instructors, preparing them for success on day one, and providing professional development and re-certification opportunities to help them grow professionally throughout their career. 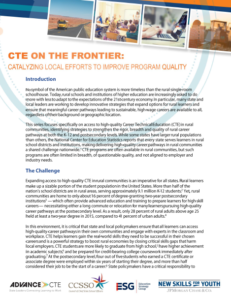 Today, Advance CTE released the fourth, and final, installment in the CTE on the Frontier series, which examines challenges and strategies for expanding access to high-quality career pathways in rural areas. The series is funded through the New Skills for Youth initiative, a partnership of the Council of Chief State School Officers, Advance CTE and the Education Strategy Group, generously funded by JPMorgan Chase & Co. Adopting a diversified approach to recruiting and training new instructors, establishing multiple pathways into CTE classrooms. CTE teacher recruitment is a challenge that has dogged state leaders for decades. 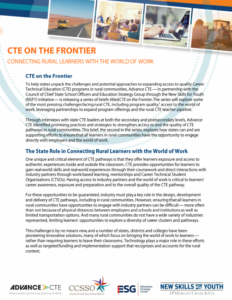 According to a recent survey of State CTE Directors, 98 percent said that increasing access to industry experts is a high priority in their state. And 20.4 percent of rural districts with CTE teacher vacancies report that CTE positions were either very difficult or impossible to fill. Such teacher shortages are exacerbated in rural areas, where the pool of qualified candidates is often much smaller. 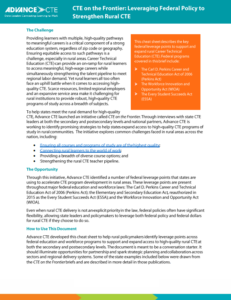 This brief aims to elevate promising practices across the states to help state leaders address rural CTE teaching capacity challenges.